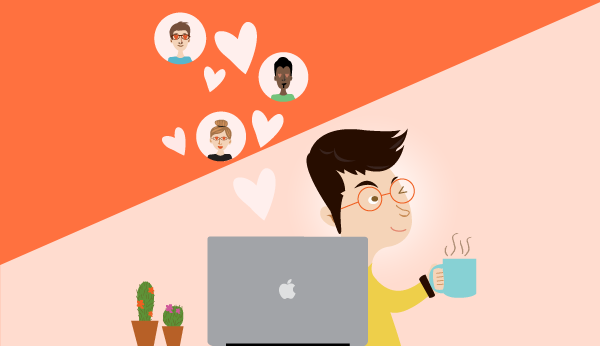 Want your customers to fall in love with you and your business? Of course the obvious starting points is to provide amazing services and/or great products. But to make your customers really love you, there are little things you can do that make a big difference to their perception of you. When your customers like you, they’ll want to help you. They’ll want to give you their business and refer you to all of their friends. It’s all about being human and taking an extra step to show that you care. When customers know you care about them, they care more about you. Start with this list of 6 things that will make your customers love you. Send your clients a short email or mail them a card to say happy birthday or congratulate them on their anniversary. Your customers probably won’t expect you to remember, so when you do it shows them that you care enough to say “hey, I was thinking about you and remembered today is a special day for you.” You don’t need to be Rain Man to remember either, just add these dates to your calendar and if you’re using Daylite, you can create a Smart List for birthdays and anniversaries so you have a heads up. You may be too old for Valentine’s Day cards, but that doesn’t mean clients don’t appreciate getting a card or personal email to say Merry Christmas or Happy Hanukkah. Sending out a holiday greeting card is a great way to give clients a friendly reminder that you’re still around and thinking about them, even if they haven’t needed your services in a few months. In Daylite you can easily Print Envelopes & Labels for your clients to send them holiday greeting cards. Reward your clients that have made a big impact on your business–the ones that have stayed a loyal customer for a long time or referred you a lot of business. Send them a gift basket to show you appreciate their business or tickets to a sport game that they love. You can even do small things like sending them free swag like mugs or t-shirts. People love getting free stuff. It’s really nice to know that when you’re talking to people, they’re actually paying attention to what you are saying. Try to jot down those little details your clients reveal over your chats on the phone or their drop-ins to your office. Did they mention their pets, kids, or hobbies they’re interested in? Show you care about them on a personal level by remembering these little details and bringing them up when you see them. Photographer Francis Zera knows his memory isn’t as good as Rain Man’s so he uses Daylite custom fields in his contacts to include things like his client’s children’s names, their pets, etc. That way he just needs to quickly check Daylite to refresh his memory before calling a client or going to visit them. He even keeps track of things like their favourite treats or anything they’re allergic to so he knows what to get and what to avoid when making up a gift basket. This is an obvious one, but easily overlooked. A genuine thank-you goes a long way. Your customers are what keep your business alive, you owe it to them to show you are grateful. Even better than saying thank-you is writing it. Personal thank-you notes say you took the time to show that you appreciate your customers and it means a lot today when people rarely send handwritten notes. 6. Keep your clients updated. Depending on what kind of business you’re in, you won’t always be in contact with your clients. Maybe they needed your services a year ago and haven’t yet since. Maybe they purchased something from you a few months ago and won’t be needing anything for a while. That doesn’t mean you should forget about them, otherwise they’ll forget about you. Stay top of mind with your clients by letting them know what you’re up to. They might not need you right away but that doesn’t mean they won’t need you again in the near future or have a friend that they could refer to you. Small businesses are always changing so let your clients know about the changes you’re making. People want to know you’re making improvements to help serve them better, and they won’t know unless you tell them. You can send out a newsletter, a personal email, or pick up the phone and call your clients about changes that have happened with your business. It’s a great way to open the door to conversation to see if there’s anyway your services or products could be of help to them.